On 6 October 1915, the House of Commons suffered its third loss of a Member of Parliament within a week, when Lieutenant Charles Thomas Mills, remembered by the Middlesex Chronicle as ‘the hero legislator of Uxbridge’, was killed during the battle of Loos. This engagement had already claimed the lives of Thomas Agar-Robartes and Lord Ninian Crichton-Stuart. Mills was the youngest MP to be killed in action during the First World War, aged 28 at the time of his death. At the January 1910 election, which saw him returned as Conservative MP for the Uxbridge division of Middlesex, he was the second youngest parliamentary candidate. 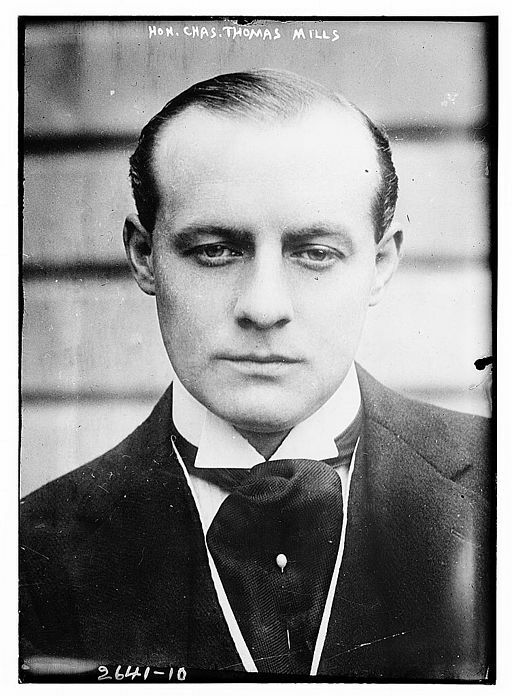 Since the youngest candidate, Viscount Wolmer, was not elected, it was Mills who at the age of 22 became the ‘Baby of the House’, a title he held until Wolmer joined him in the Commons after the December 1910 election. Although his youth and political inexperience had led some to question his selection as a Conservative candidate, Mills won over the doubters during his first election campaign in January 1910, when ‘his manly and outspoken utterances from the platform; his sparkling wit; smart repartee at opponents, combined with an irresistible charm of manner, quickly won all hearts, and even commanded the respect of opponents’. Mills had a distinguished political pedigree. His great-great-grandfather, William Mills (1750-1820), had been MP for St. Ives, 1790-6, and Coventry, 1805-12. His grandfather, Charles Henry Mills (1830-98), had sat for Northallerton, 1865-6, and West Kent, 1868-85, and was created Baron Hillingdon in 1886. His father, Charles William Mills (1855-1919), represented West Kent, 1885-92. From 1898, when his grandfather died, Mills was heir to the Hillingdon barony and the family estates. He was one of the level-headed young men in the House. He spoke rarely and only on matters he knew something about. When a problem of finance was before the House he was often there armed with unassailable facts straight from the experience of one of the greatest banking firms in the world. Like most of those M.P’s. who have something to say with real knowledge behind it, he was modest in utterance and never vociferous or verbose. Mills had been a lieutenant in the West Kent yeomanry since 1908 and joined them on home defence duties when the war began. However, as the Middlesex Chronicle reported, rather than staying at home ‘in comparative ease and safety’, he chose ‘to take a sterner and more patriotic part in the great struggle’. He was commissioned as a second lieutenant in the 2nd Scots Guards in May 1915, and left for France in June, when his constituents held a large farewell gathering in his honour. In him we have lost, not only a dear friend, but one of the best officers in the Battalion. He was a born leader, and the men were devoted to him. For the last two days his trench was subjected to a very heavy bombardment; the trench was being constantly blown in, burying and killing the men. He was up and down the trench all the time, encouraging the men to hold on and setting a splendid example. His death was instantaneous, as he was struck in the head by a fragment of a shell. Mills is commemorated on the Loos Memorial. He was followed as MP for Uxbridge by his younger brother, Arthur Robert Mills, who was called home from Gallipoli in order to stand. This entry was posted in 20th century history, diplomatic history, military history, World War I MPs and tagged Baby of the house, Battle of Loos, Conservative Party History, WWI MPs. Bookmark the permalink.